Here’s another one of my favourite meals. I LOVE Sweet Potatoes. I’m a creature of habit; once I find something I love I stick with it especially if it works for me. Because there are only a handful of ingredients, this recipe makes doing Meal Prep for the week a breeze. These are the ingredients for one dish but you can easily adapt the quantities in this recipe to feed the entire family. Use a non-stick baking pan or line pan with foil for easy cleaning. 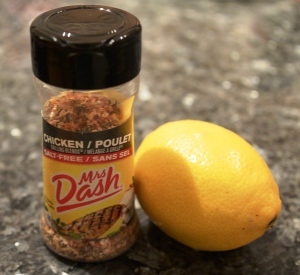 Place frozen or fresh chicken breasts on baking pan and squeeze fresh lemon juice all over. Season with Mrs. Dash. Peel and cut up Sweet Potatoes and place on a separate non-stick baking pan; season with salt (Option: try seasoning with Paprika too). Bake both the chicken breast(s) and sweet potatoes in the oven at 425 degrees for 30 minutes. Heat a non-stick pan with 1 Tbsp. of coconut oil and add sliced zucchini, season with sea salt and pepper to taste. Cook for 10 minutes on medium heat. This dish is quick, simple, nutritious and is one of the staple dishes that STRONG GIRLS’ use as part of a Fat Loss Diet. For my kiddies, two out of the three don’t like sweet potatoes so I will usually offer brown rice, homemade fries or mashed potatoes as an alternative. I still offer green veggies; they may or may not eat them but I try to offer veggies so they understand that it’s part of eating a healthy balanced meal. What are your favourite low-fat chicken recipes? Mom Down, How Does Being Sick Affect You? How to Eat Pizza and Still Get Abs?